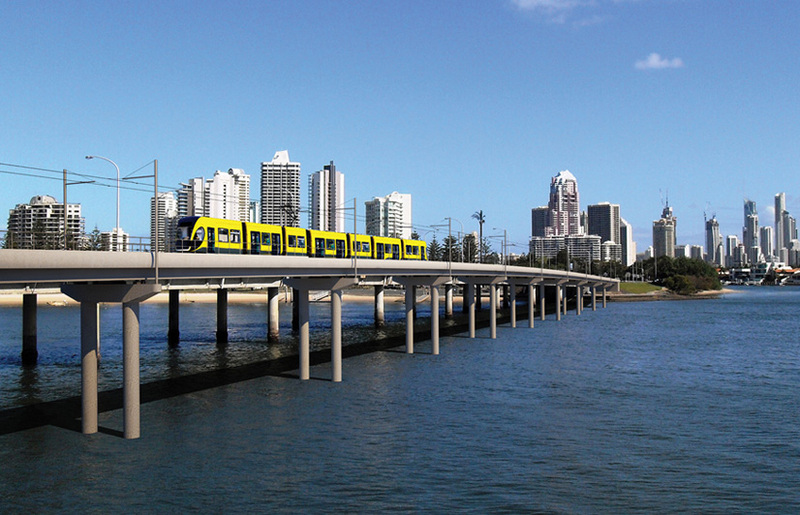 A whopping 97 percent of journeys to work are made by car in the Gold Coast. This was one of the first confronting statistics shared at the Fourth International Urban Design Conference, held on the Gold Coast this September. Fortunately, however, this figure was shared on a tour of the Gold Coast Rapid Transit Route & Corridor Planning Study, an ambitious $1bn project that attempts to make inroads into that figure. Currently being developed as a land use project rather than a transport project, the hope is that the light rail will act as a catalyst for the development of its surrounding corridor. A huge development comprising of a university and hospital is already underway at one end of the line, which will be well served by this new infrastructure. The tour also passed a number of high-rise buildings in Surfers Paradise, including the Q1 building designed by Atelier SDG and completed in 2005, which at 322.5m tall is the world’s third tallest residential building. While the verticality of this tower may be impressive, the ground floor, like many of the high-rise buildings in the surrounding vicinity, has a very weak street frontage. This is an aspect that is set to improve, as a decent streetscape outcome is now required for all developments in the district. This consideration for streetscape was a theme also discussed during Kate Pleban and Tina Ngu’s presentation, ‘Resilient Design in CBDs’. Examining changes in building controls, Pleban and Ngu explored how Melbourne’s cityscape altered after the 40-metre height restriction was abolished. This change gave rise to taller city buildings that were set back from the street with plazas in front, creating discontinuity in the streetscape. Although good as landmarks, Pleban and Ngu argued, too often these buildings lack engaging interfaces. This is also now being addressed in new built-form controls. Phillip Roös, Sustainable Design Practice Leader at Sinclair Knight Merz, presented the Melbourne Metro rail tunnel project, sharing his insight into the processes involved in getting a strong sustainable agenda into the project. While the original brief contained a mere one-line mention of sustainability, pressure from certain individuals behind the project ensured the final brief detailed a more thorough and considered sustainable agenda. As Melbourne transforms from a monocentric city to a polycentric one, Roös explained, it will require a more sophisticated public transport system. The proposed train line would run from Dynon Road, West Melbourne, through to St Kilda Road/Domain Road in South Melbourne – supporting the majority of the growth occurring in the north, north-east and south-east suburbs. There are significant challenges with this project, not least the Yarra River and associated geological conditions. A number of environmental features will be implemented, including exposed thermal mass; twin bore tunnels rather than single bore – thus reducing soil excavation and concrete requirements; natural ventilation; a tri-generation system for heating, cooling and energy; PV panels on the stabling yard roofs and regenerative braking – an energy recovery mechanism that recaptures kinetic energy and utilises it in other ways. Continuing with the transport theme was ‘The Bicycle Oriented Development’ presentation by Dr Steven Fleming, set in 2021, which proposed a speculative 20 percent uptake of bicycle riding (compared to a very low 2 percent currently). Road speeds had lowered and road hierarchies reshuffled, while circulation had improved to allow ramps in place of lifts and the inclusion of ‘ride-thru shops and schools’ had improved convenience for cyclists. The road hierarchy reshuffle was also addressed by Steven Burgess in ‘The Comeback of the Humble Street’, which called for a return to the lost art of street design that considered pedestrians first and bikes second, with the car at the bottom of the list. Despite being an upbeat and amusing talk, however, Burgess admitted to thinking it a multi-generational change rather than an immediate one. Is it optimistic, realistic or way off the mark to think these changes are achievable by 2021? One audience member made a pertinent observation that much needed to be done now to encourage cycling, rather than relying too strongly on the rise of petrol prices in the future to force the take up. A variety of talks during the two days ranged from a very technical and scientific discussion of a carbon neutral development at Lochiel Park to a description of the architectural and landscape code of an Ecovillage; from look at ‘McUnits’ and ‘McMansions’ to a discussion about killing chickens during Ned Wales’ ‘FIMBY (Food In My Back Yard)’ talk. In this latter presentation, Wales asked how many of the audience were currently growing their own fruit and vegetables – with a positive response of a staggering 80 percent. With an audience that shared Wales’ passion for urban agriculture, this figure will not represent the general population – but there are signs that it is becoming increasingly popular. Opportunities to do so, either via balconies, courtyards, gardens or allotments, need to be provided. Considering the rise of medium density housing, particularly in the form of the perimeter apartment block, it is important that this type of housing provides sufficient outdoor space for inhabitants to use for urban agriculture. By contrast, however, Mark Allan – in his talk ‘Designing Sustainable Precincts’ – claimed that while cities are the answer to accommodating an increasing population in a sustainable way, the reality is that the huge cost of inner-city building is acting as a deterrent, while cheap building costs in the outer suburbs allow for continuing sprawl. Food production is, like water, going to become an increasingly scarce commodity. Intensive farming, producing cheap food that lacks nutritional value with a hefty reliance on pesticides, can no longer be seen as resilient because of the confined carbon economy we are entering. Wales discussion touched on the meagre three-day supply of food stocked by shops, compounded by threats of political instability, natural disasters and environmental degradation that all impact food production. Wales’ happy alternative explored the lesson of Cuba’s urban agricultural revolution, which saw huge swathes of open spaces, parks, gardens and disused land turned into ‘agraponicas’ or small community farms. Examples like this prove that resilient cities not only depend on reliable infrastructure and transport networks, good urban planning and sustainable and diverse development, but also require a network of ‘local’ urban communities to ensure our future built environments can adapt to growth and respond effectively to change and natural disasters. These conferences enable practitioners to share a wide range of ideas and solutions to delivering a more sustainable built environment, and it is vital that these lessons are taken away and applied in the form of urban guidelines and strategies to ensure the success of our future cities. Jo Leeder is an architect with a particular interest in sustainable architecture, urban design and policy. She is also a keen writer, and has previously written for The Architect’s Journal sustainability blog, Footprint. A good article on the conference. I thought it was a worthwhile event and you have captured some of the key themes. I look forward to next years conference in Melbourne. A University of Technology initiative considering the many benefits and discussions around Urban consolidation or Density. An interesting conference but a somewhat routine focus on the present day application techniques which underly the sustainment of existing urban forms, eg different ways of getting people to work in tall buildings, without questioning the possibility that the evolution of tall buildings evolved in response to concentrating forms of workplace transit (trains, trams) which are no longer ‘taken up’ at the rates required for sustainability. (Melbourne is of course an exception where this infrastructure is well established and well used.) One might desire a discussion of development morphologies which are new and as well suited to dispersing forms of individual transport (autos, cycles) as well as the earlier–and perhaps obsolescent–dense and tall development forms were suited to concentrating ones (trains, trams). just to clarify the 97 per cent of journey to work by car figure. This is typical of the low density suburbs to the west and near the highway. Closer in the the beach with the higher densities and better public transport we find very high walk to work, cycling and PT use and much lower car use. Its all about the urban form shaping the way that people live.